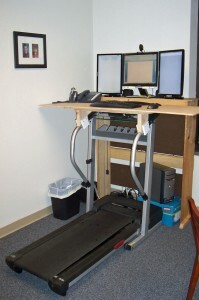 C) Building this – a Treadmill Desk. Now you probably already, for numerous reasons think I’m wacko. Fine. So I have no qualms about sharing more of my wacko ideas……. I’ve been a runner for over 33 years – hardly ever missed a day. But the last 2-3 years have been gradually more and more crippled and it has got to the point where my legs won’t run. I get terrible calf cramping (from lack of oxygen) when I run, just after 2-3 minutes now. I vowed last year to get back on top of the running game, something I love. No go. So I have to do something. It isn’t the whole solution but I think sitting has been killing me. So I intend to just walk while I’m working. I’ve transitioned in my career and especially this year – to working / teaching mostly from home. I love it. I’m doing great work. 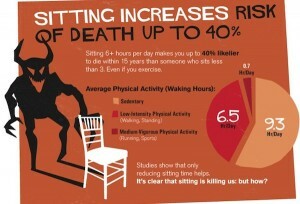 But alas, I sit a lot! I think it is killing the circulation in my legs and it is a warning for others who also teach online, at a desk. I know a thing or two about treadmills, also running. (see the slideshow below). This seemed like a great solution. Right now it is an experiment that I’ll report on later ……………… Maybe some others who are wacko enough can join me? Previous story Reflective Then, Reflective Now …. That is awesome, David. I want one in my office. I’d settle for a standing desk though. I’ll have to get to work on that. I walk a lot and go to a health club, but I’m still afraid I’m sitting too much. You don’t have to go “whole hog” like me. You can easily on gmarket, pick up a non motorized treadmill which fits easily under a desk. When you stand on it, you can walk, it uses your own momentum to feed the treadmill energy. They can’t be more than 100,000 won…. (not sure though – that’s what they are here in Canada). But thanks for giving me the idea. Knew about it but just needed the reminder!